Bhatmaam has arrived and drinking hot Kaapi! 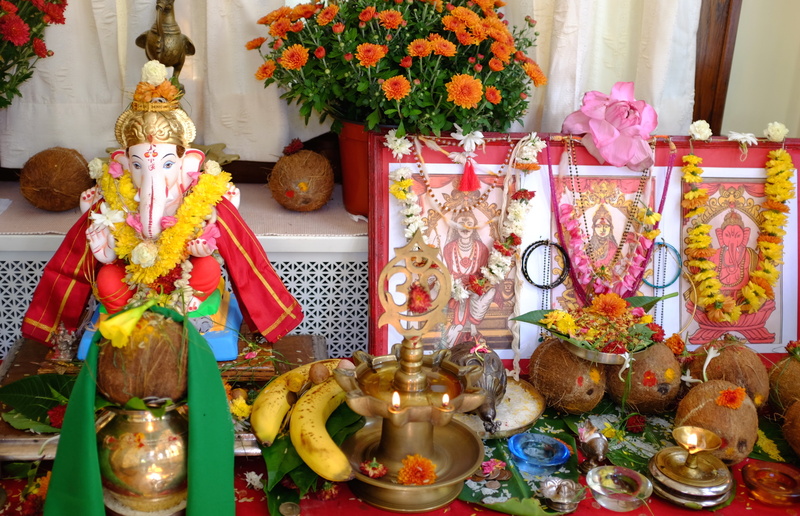 Here is the live stream of the Colaba Ganapati puja from Millburn, NJ. I have previously written about the mid-day school lunch at the Shanbhag High School and the primary Saraswati Vidya Kendra in Kumta. When I visited Kumta earlier this year, I took a few video snippets of students lining up for lunch and the KG students chanting the blessing. In the Kumta market, these women set up shop early in the morning before the crowds got there. Those vegetables look so delicious! It was March, so the variations of brinjals/eggplants were in season. You will also find konkani classics padwal, ghosalae, muLi (radish), tambdi bhaji (red leaves), vaaLi (green creeper leaves), muggae, karate, maskaa sang, jaam and others. If you notice others, let me know. Hindus believe that all things animate and in-animate (manifest or unmanifest) are part of the universal divine consciousness. We generally refer to this divine consciousness as “That”, because any attribute you give it is limiting (see Sant Tulsidas’ beautiful verse describing “That” divine consciousness; also this post on Dwija). In common parlance, we refer to “That” as Paramātmā or eternal soul (1). It thus follows that all humans are part of this eternal soul or Paramātmā. The corollary then is that Paramātmā too includes human qualities, strengths and frailties, and expresses human emotions. Purān and itihās (history) are filled with their anthropomorphed lore. In our temples, we adore our divine just like we would our valued guests. In the common Hindu puja, we pamper our divine guest with 16 services (shodasho upchār) like if she was a valued friend, like cleaning her feet, helping her brush, bathe, providing new clothes, jewelry, sumptuous feasts, etc. Completing this anthropomorphization our temple bound deities like to go out on the town and have fun. Wouldn’t you if you were couped up in a tiny garbha-griha? Thus in many communities, devotees take their temple deities out for a ride in a specially designed pālki (palanquin) (2). Every Monday evening at the Rāmnāthi Devasthān, Rāmnāth Dev sits in a pālki and is carried around the grounds. It’s a festive occasion with a small band playing and devotees chanting bhajans. 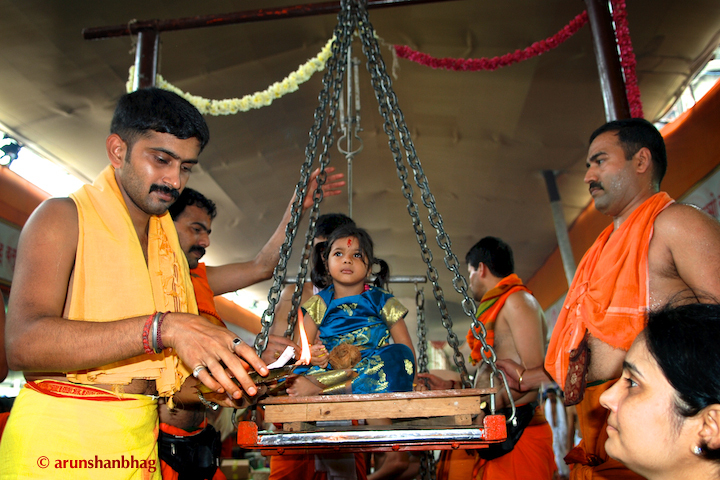 Following tradition, the pālki has designated stops where aarti is performed and verses of the Mangalāshtak are chanted. Pālki is followed by a sumptuous prasād (yaay). On special occasions, Rāmnāth Dev is accompanied by Kāmākshi Devi on his jaunt around the temple grounds. These pictures are from the recent Mahā Shivrātri when Rāmnāth and Kāmākshi went around the temple in their respective pālki (3) . While Rāmnāth sits in his simple pālki, Kāmākshi, verily the Goddess of Desire and Sensuality, tours in style, high on an elephant pālki. How cool is she? 1. The word God doesn’t exist in Hindu vocabulary and is a Western construct. 2. In Mumbai you commonly see Muslims take their sacred deity out on the town; recently in Kumta, I noticed the local christians in a procession with their deity in a pālki. 3. Plural of pālki remains pālki and not the anglicized pālkis. In a Hindu tradition called Tolay Bhaar families celebrate life events by offering their weight in fruits to the divine. These fruits are then served to devotees as prasad. At the GSB Seva Mandal Ganapati, this tradition takes on mammoth proportions where 1000’s of devotees offer everything from the more traditional coconuts, bananas or modak/appams (the sweet dollop made during Ganapati festivals), to gold or silver jewelry.